For years 'challenging' was perhaps the best face you could put on AMD's financial results as they slogged through a market that did them few favours. Even riding high on the first generation of Ryzen, FY2017 saw them post an overall loss. Now however their fortunes appear to have conclusively turned as both a solid product portfolio in all segments and good sales have sent them into the black, posting net income of $337m versus the small loss of $33m in the year before. With revenue now up to $6.48bn, a 23% increase year over year, there's plenty for the Red Team to be confident about as they dead into what's likely to be a tough 2019. Clear positives in 2018 were Ryzen and EPYC products, with the latter gaining traction with Enterprise customers in a market AMD have struggled to penetrate in the past. Ryzen 2 and Threadripper continued AMD's strong showing in the desktop market from entry-level to enthusiast. And AMD didn't over-stretch themselves by betting too heavily on demand generated by the Crypto market, demand that dried up quickly as Q2 2018 hit. Heading into Q4 they did suffer from the hangover of higher GPU inventory lingering in the channel than they would have liked, but all in all it didn't turn out too badly. Q4 revenue was up 6% year over year, but down 14% compared with Q3 due to lower revenue in the Enterprise, Embedded and Semi-Custom segment. Margins remained strong however, driven by Ryzen and EPYC products. And, crucially, the record of quarterly net profits continued. As we pass into 2019 that word 'challenging' crops up again. 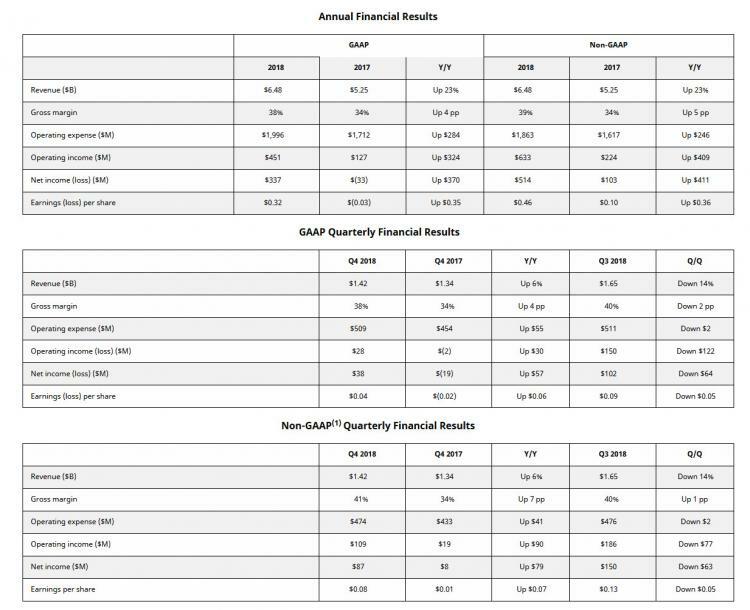 AMD won't have the benefit of crypto-related GPU sales this time around and some stock still needs to be cleared out from the channel, which means that they're expecting significantly lower Q1 revenue both compared with last quarter and year-on-year. Nonetheless their core business of Ryzen, EPYC and Radeon datacentre GPU products are expected to increase sales, and of course 7nm designs are set to roll out in the not too distant future. The full Q4 2018 Financials press release can be found here.